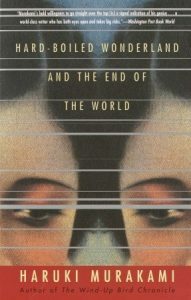 Hard-Boiled Wonderland and the End of the World, Haruki Murakami (translated by Alfred Birnbaum), c1985, 1993, Vintage, ISBN 9780679743460, 400pp. After trying and failing to get further than a third of the way through The Wind-Up Bird Chronicle by Haruki Murakami, I switched to his Hard-Boiled Wonderland and the End of the World. While I managed to make it through that one, I remained perplexed pretty much throughout. That’s a serious accomplishment for Murakami, because I’ve been reading fantastical literature for over four decades and can handle at least six impossible things before breakfast. I won’t go into a plot summary (if you need one there’s a fine example on Wikipedia), but will instead focus on comparing and contrasting with other works. From a science fiction point-of-view, this has some interesting modern elements—not quite Cyberpunk , but a definite nod to that sub-genre given the dystopian society ruled by a secret war between the single massive corporation and its hacker opponents who may or may not be government sanctioned. For all that, the focus here is less on science or society, and more on the character’s ability to fit into that society. More than any genre book, the work that this resembled that constantly came to mind was Herman Hesse’s The Glass Bead Game. Like Hesse, Murakami never explains his world, either in how it actually works or what occurred for it to be that way. Normally this is a good thing—too many writers err on the tell side of the “Show, Don’t Tell’’ dictum. But no telling at all seems to be just as much of a trap, where the reader lacks any understanding of the basic rules of this strange new world and when things happen it is difficult to classify these occurrences as normal in this world or unusual, and thus being able to read the reaction of the characters to the events as alarmed or unconcerned is even more difficult. Like Saramago’s Blindness, another recent literary work with a science fiction premise, what Murakami may have been attempting here was an allegorical comment on current society. I have no problem with that in a novel. The literary world needs some new Brave New Worlds and 1984s. Unfortunately, neither Blindness nor this novel are unambiguously allegorical, and thus come across for me as simply confusing.